This is a fun twist on a classic Poutine topped with a crispy chicken filet and drizzled with a tangy Ranch white BBQ sauce. In a bowl combine the Hellmann's® Creamy Ranch dressing, lemon juice, garlic, olive oil, cider vinegar and black pepper. Whisk until all the ingredients are blended, keep refrigerated. If you have chicken tenders, remove the tendon using a paring knife. If you have chicken breasts, cut each breast into strips approximately 4” by .25-.50”. Take half of the marinade and combine in a bowl with the chicken. Refrigerate for 2 to 6 hrs. In a medium bowl combine the flour, seasoned salt, poultry seasoning and Paprika. Drain the chicken slightly and dredge in the seasoned flour. Fry in oil at 350°F for 6-8 minutes until golden brown. Deep fry a portion of fries. In a bowl place a portion of fries and top with a portion of cheese curds. 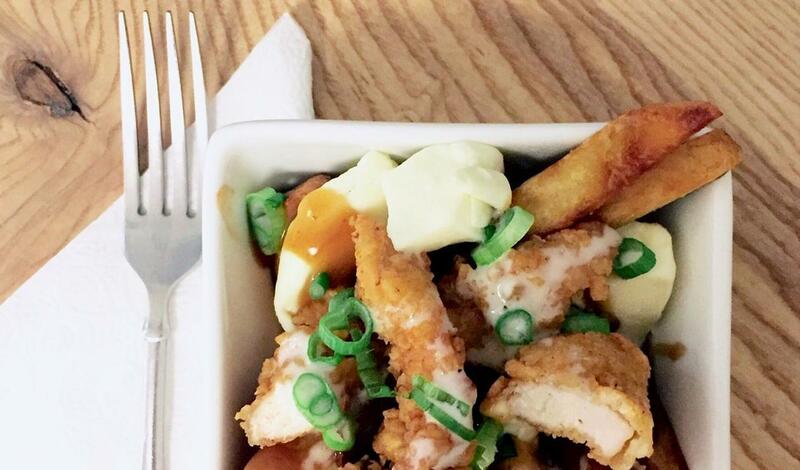 Ladle 4 oz of the prepared Knorr® Classic Poutine Gravy on top of the fries and cheese curds. Add 4 oz portion of chicken filets on top and drizzle with 1.5 oz of the Ranch sauce.